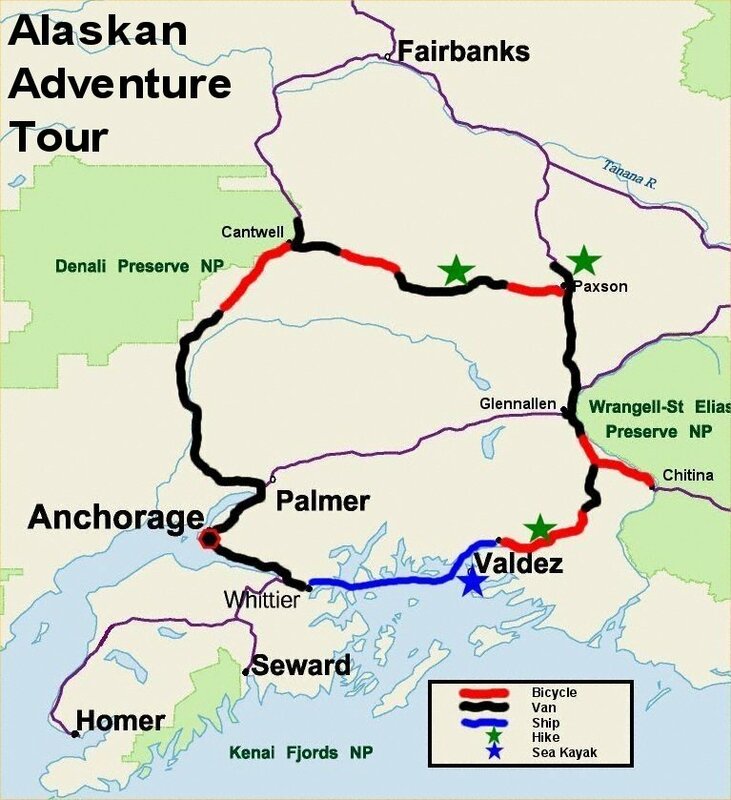 7 day, 7 nights, $3595 U.S.
Less strenuous than our purely bicycling tours, our Alaskan Adventure Tour combines half days of bicycling (average 30 miles) with canoeing, hiking, sea kayaking, a spectacular drive across the Denali Highway, and an awesome glacier cruise across Prince William Sound. The 7-day, 7-night package includes all meals, lodging, Cannondale Bicycle, glacier cruise, canoes, and sea kayaking at Shoup Glacier. After breakfast in Anchorage, we get in the van and soon leave all vestiges of the city behind us. We cross over the Knik and Matanuska Rivers, skirt the Talkeetna Mountains, and head north toward Mt. McKinley and Denali National Park. The Alaska Range now looms to our left, dominated by Mt. McKinley, at 20,320 feet, the largest mountain in North America. We start our ride at a Denali Viewpoint. We eat lunch at Hurricane Gulch, a deep cleft in the side of the mountains. We continue riding along the Chulitna River for several miles, and then suddenly turn across the river. The road quickly rises to tree line for a long glide across Broad Pass. The mountains surround us on three sides with Mt. McKinley on our left. Our ride ends at Cantwell, where we hop in the van for a 20-minute ride to dinner and our cabins. Total bicycling: 39 miles. We explore the Denali Highway, taking our time to make stops to enjoy the mountains, view wildlife, and explain the signs of glaciation. We ride the bikes for about 15 miles along one of the most scenic parts of this unpaved highway and then proceed to McClaren Ridge where we hike toward the massive peaks and glaciers of the Alaska Range. The trail follows a lake-studded ridge high above the tree line. Total bicycling: 15 miles. At the Tangle River Inn, we pick up paddles and head out onto the Tangle Lakes in canoes! The placid lakes take us far back into the pristine wilderness populated by caribou, moose, and bear, as well as a host of exotic birds. After lunch, we bicycle the 20 paved miles of the Denali Highway. The entire ride is well above tree line, with sweeping vistas of the nearby Alaska Range, and far off to the south, the magnificent snow-capped volcanoes of the Wrangell Mountains. Total bicycling: 21 miles. After breakfast, we visit the ice age as we hike up Phelan Creek in the Alaska Range to its source at the face of Gulkana Glacier. If conditions allow, we continue right up onto the glacier! In the afternoon, we bicycle from the Alaska Range into the Copper River Valley. We eat dinner near the base of the Wrangells at the historic Gakona Lodge (Est. 1906). Total bicycling: 30 miles. A hop in the van takes us past the Wrangell Mountains to Stuart Creek, where we mount our bikes and wind our way up the Tsaina River toward Thompson Pass. On the way, we view Worthington Glacier, only yards from the road! Thompson Pass is only 2,678 feet but far above the tree line, and the views from here are truly spectacular. Don't forget your camera! We now drop 2500 feet in six miles into the Lowe River Valley. We ride through the vertical rock walls and numerous waterfalls of Keystone Canyon. Just across the river is Bridal Veil Falls, over 700 feet high! We spend the night in Valdez across the bay from the Trans - Alaska Pipeline Terminal. Total bicycling distance: 33 miles. Sea Kayaking! We climb aboard a water taxi for a ride through Prince William Sound to Shoup Bay, where we begin this scenic journey. Shoup Bay offers the full spectrum of wildlife with seals, otters, bald eagles and sometimes even whales! Over the course of the day, we will paddle past floating icebergs, past a nesting colony of Black-Legged Kittiwakes, and right up to the face of Shoup Glacier! We enjoy a picnic lunch with a spectacular glacier view. At the end of our paddling, we are picked up by motorboat for the ride back to Valdez. We wake up early and board a ship of the Alaska Marine Highway for an unforgettable trip across Glacier studded Prince William Sound. We usually see sea lions, otters, and porpoises, and about half the time we have a chance to see whales. We leave the ship in Whittier, drive UNDER the Chugach Mountains to Portage, and then continue on to our farewell in Anchorage. 7 Days, 7 Nights $3595 U.S.
Sunday, Aug 11 to Saturday, Aug 16 SOLD OUT!